Last week I mentioned that I was making Chipotle Tostadas from Raw & Beyond for dinner one night. Well I did make Chipotle Tostadas but mine were a little different from the recipe. 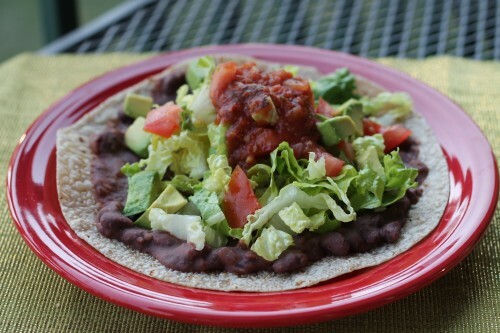 I didn’t have any dried beans, tomato powder and decided to use large brown rice tortillas instead of sprouted grain. Below is my take on this recipe from Raw & Beyond. Cover the bottom of a small sauce pan with some of the reserved bean liquid. Heat over medium-high for a minute and then add the onion; cook for 5-6 minutes until soft. Stir in the garlic, salt, cayenne, cumin, and chipotle chiles; cook for 30 seconds. Add the beans, remaining liquid and tomato paste. Bring to a simmer and cook for 5 minutes. Place 2/3 of the bean mixture into a blender or food processor and blend until smooth. Return to the pan and stir to combine. Reduce heat to low. Heat the tortillas in the oven at 250F until crispy, about 15 minutes. Top each tortilla with 1/4 of the bean mixture, 1/4 of the avocado, 1/4 of the romaine and a big dollop of salsa. Other great additions are cilantro, vegan sour cream and/or hot sauce. *I use Eden Organic Kidney Beans because they are preserved in water with kombu. If you are not planning to use Eden Organic beans make sure to rinse and drain your beans. You will also have to use water in replace of the bean liquid.